One of my top priorities for this weekend was to get organized. Once again I found that shoes had exploded on the floor of my walk-in and once again I felt like my wardrobe was becoming unmanageable. It was time to take action. A while back Todd agreed to build a shoe shelf for my closet but until that time comes I needed to come up with another plan. I also needed to go through and take a critical eye to my entire wardrobe. This includes clothing, accessories the works. It took me 2 hours but I am feeling pretty good about my results, so much so that I decided to share. I have no “before” photos to share because honestly the state of things was so pitiful I would be mortified to show it off. Here are my post organization photos though. Let’s start with shoes, that is where the problem really began in the first place. I own more pairs that I care to admit to and they had taken over the floor of my closet. I started with my heels. I singled out a few to be sold and/or donated, the rest go on the top shelf of my walk-in. 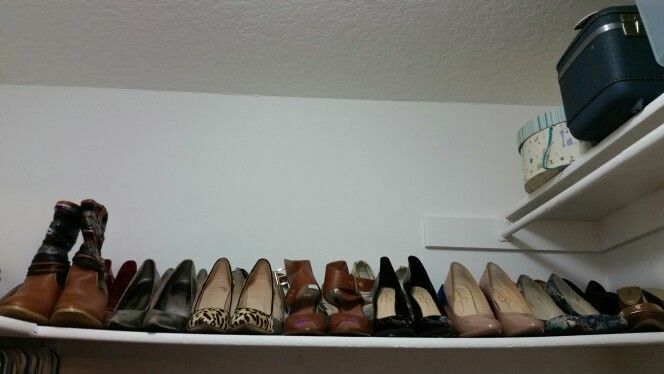 My closet has a wrap around shelf at the top, it is the perfect spot to display some of my favorite shoes as well as keeping them from being damaged. I have a chest of drawers in my closet that formerly held miscellaneous clothes I rarely wore. I removed most of its contents to be donated and am now using it for my flats and wedges. It serves as the perfect place to have easy access while also keeping them from being damaged. 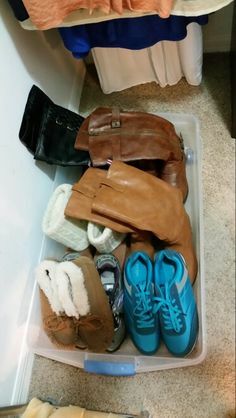 What is left over in my ever-growing shoe collection is my boots and sneakers. These I now keep in a plastic storage Tupperware under my dresses. I am less concerned about them being damaged, they are a bit more rough and tumble and it is a good use of floor space while still maintaining order. Next I attacked accessories. 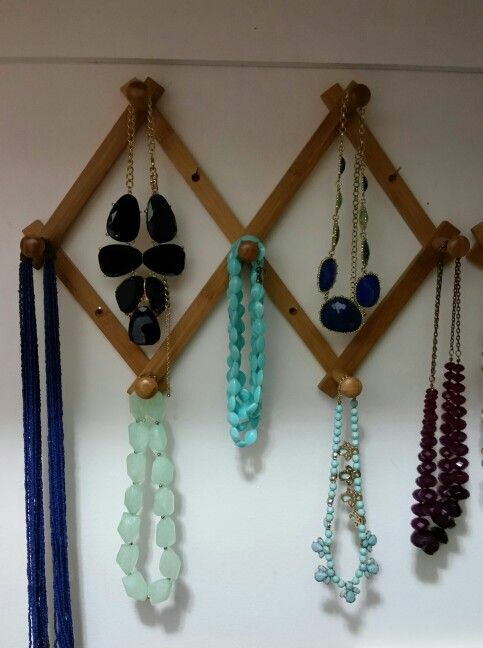 When we first moved into the house I mounted these racks over my chest of drawers in the closet to hang my statement necklaces on. It is the ideal place to display and store this part of my jewelry collection. My scarves are another area of my wardrobe where I felt I had lost any sense of order that was once present. 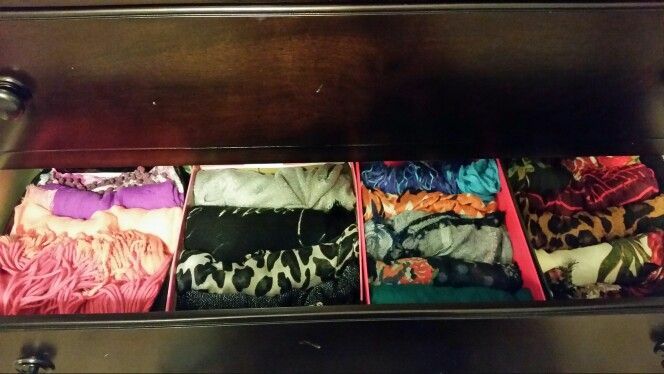 To correct this situation I went through and separated scarves I no longer wear to be sold/donated and then rolled the rest up by color and placed them into four separate shoe boxes. 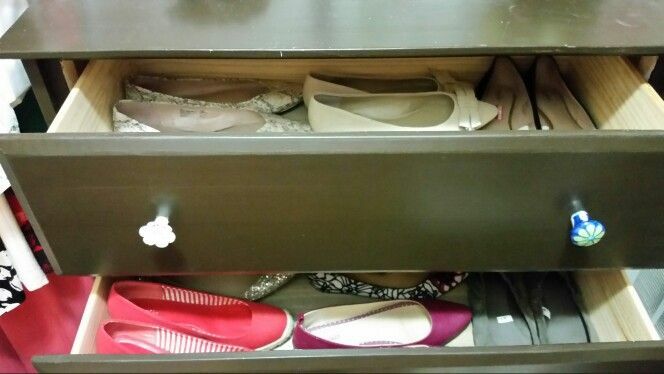 These shoe boxes are the perfect size to fit into a drawer again allowing practical storage and easy access. Last on my list of accessories were mt hats and belts. Belts got divided up by frequency of wear and put into different baskets. 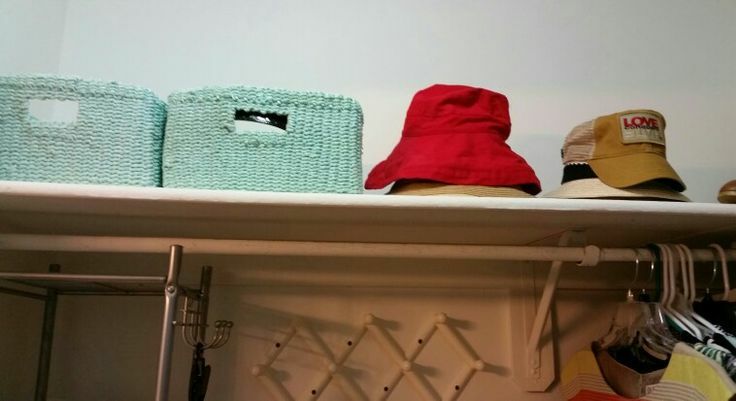 Hats stacked neatly on the top shelf. The last thing to tackle were my clothes. This is always the most overwhelming part of the process though. 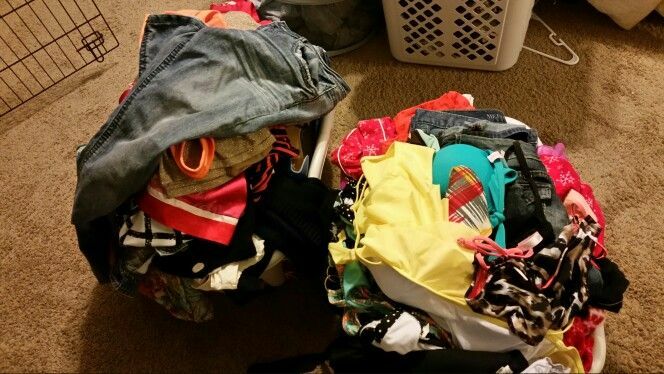 I started by taking everything out of my closet and going through it piece by piece. Once everything that was slated to be sold/donated was taken out I put the rest back by way of color coordination. 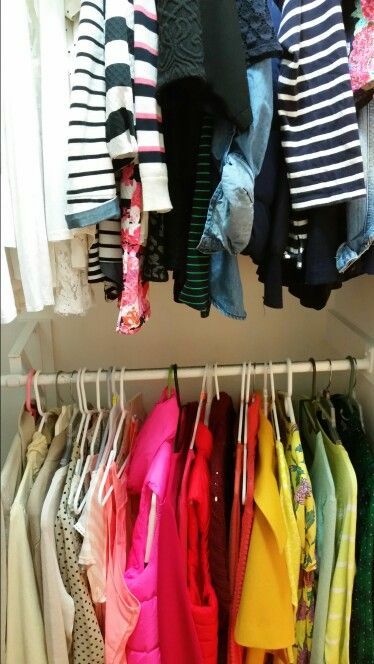 I have two racks on the right side of my closet so that is wear my tops and blouses go. 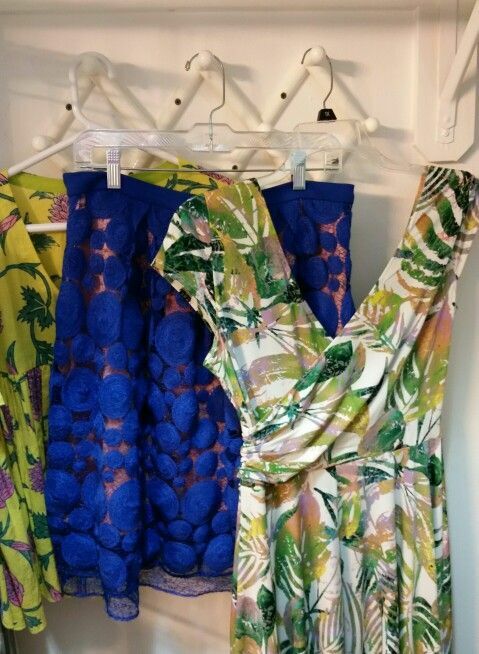 The left side has one rack which I hang my dresses and skirts on. After having such success with the racks used to hold and display my jewelry I decided it might e nice to have a rack for my outfits of the week. 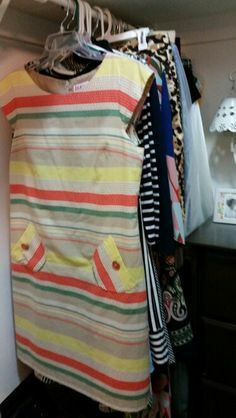 I mounted this rack on the left side of my closet a few months ago and use it to hold an outfit or two that I know I want to wear on any given week. 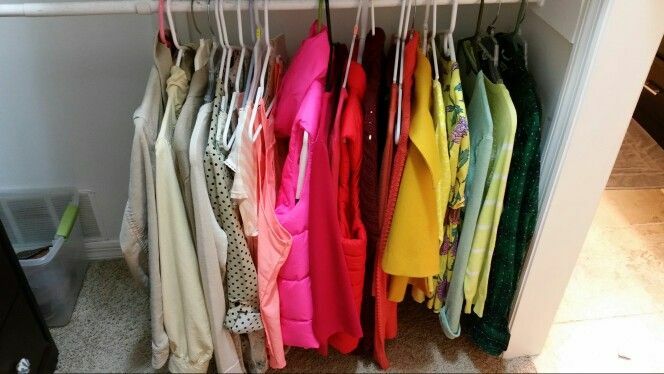 My closet is not that big so I try to make good use of any free space I have. So after a few hours of organizing and purging this is my final product. 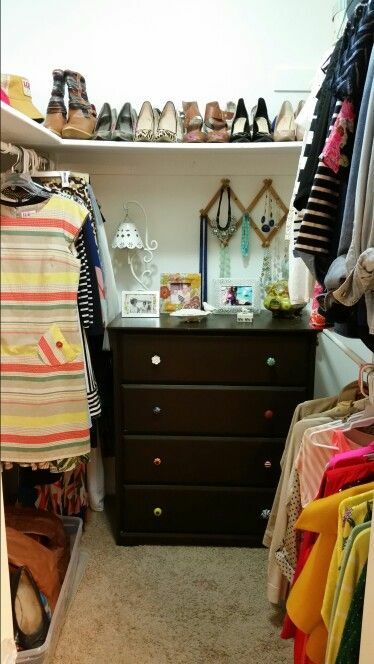 A much more organized and user-friendly closet. I also ended up with two heaping baskets of clothes and shoes to be sold and donated. Hopefully these adjustments to my daily organization routine will help get me through the next 6 months until the seasons change again and it is time to reevaluate. I am approached a few times a semester by students doing surveys or polls for classes. I usually participate depending on what it is they need. For example, I am unlikely to sign a petition if I am not personally familiar with the subject matter. Earlier this semester I filled out an anonymous survey about my exercise habits. Today I was approached again. This time it was a young-looking female student asking if I would fill out her survey about capitalism. Sure. Upon completion she asked if she could ask me a few questions, I was not busy and thought it was part of her assignment, so I agreed. She proceeded to ask me what political party I belong to, I immediately thought I don’t like where this is going, I told her I had no party affiliation. She then began to explain her feelings about public assistance. She said it is not the government’s job to take care of the poor and that all the government programs should be cut because most poor people abuse them. She also said that if the government continues to give hand outs then no one will ever have the initiative to better themselves. I just looked at her. What do I say to this? I really had to take a pause to calm myself before I opened my mouth. Some how I managed to politely say although I do not share her opinion I respect her right to it and asked if she minded sharing with me where she got her information. This very simple question rattled her. Has no one ever asked her to share her sources before? She said that she has friends who know people who use government assistance when they don’t need it. I did not think I could be further dumbfounded but she did it. I asked if she had any other sources? Her reply, Fox news. So basically she is working on third-party information equivalent to gossip and Fox news. The conversation that followed was brief. I discovered she does not know what the word equity means. I also discovered she does not know the difference between income and wealth and finally I found out that she thinks Doctors and Attorneys are the people who make up the upper 1%. It concluded with me explaining that it was hard for me to take what she was saying seriously because it did not appear she was informed and her information does not appear to come from reputable sources. I explained that if she had some facts and figures to support her claims that were obtained from reputable, peer-reviewed research then there would be something to talk about it but as it stands I felt there was nothing more to discuss. I realize I could have shared a wealth of information with her from far more objective sources but the truth is I was so offended by her lack of knowledge that I just had to stop. I did not want a random conversation with a stranger, that I secretly knew I should have never engaged in, to effect me. That was one of the worst cases of ignorance, parroting and confirmation bias I have witnessed in quite some time. I am surrounded by well-informed, open-minded, socially conscious individuals all day long, I forget that not everyone is as well-informed on the issues. This was a sad reality check. This afternoon my classmate came over and we took turns playing the role of client and clinician for our consensual interview assignment. The assignment was to record the role play so as to later review and critique ourselves. I feel good about it but am curios to see the video. My classmate will be emailing it to me tomorrow so we shall see. It was nice that she was able to come over. Although admittedly the idea of having someone from school cross the line into my personal space initially made me feel a bit wary I am glad now that we had this opportunity to get to know each other better. I become very excited when I meet people who care about the issues and that I can have meaningful conversations with. My classmate and I had great conversation after we finished our assignment. We take a similar stance on a lot of social issues, she is a bit of a soap box girl as well with her loved ones. I had to laugh at that, I know all too well how that is. We talked about LEAD that is coming up in March, it is an overnight field trip to our state capitol where we will advocate for designated causes and hope to educate law makers. We are both really excited. It turns out my classmate is a bit of an introvert as well, I discovered this as she was marveling over Todd and I’s book collection. We talked at length about our experiences as introverts and how, at times, we feel misunderstood by our extroverted colleagues. It is nice to feel related to in this way. And by matter of coincidence she is a long time boxer owner as well so she and Lucy got along splendidly. All in all it was a nice afternoon. I am glad to have the bulk of this project out of the way, all that remains is my write up. I am also grateful for this new connection I made. I had been disappointed by the lack of meaningful connections I have made in the program thus far but I am realizing now that may have more to do with me than those with whom I am in the program. I am beginning to see that I am more guarded than I realized. I feel somewhat indifferent about that fact though if I’m being honest. I have never been easy to get to know. I am more of a quiet observer at first and over time layers begin to slowly melt away with those I become comfortable with. I treat school as my full-time job, which means I am professional Jill at school and have clearly set boundaries. Professional Jill is concerned less with making friendships and more with the job and doing it well. If I am leading with professional Jill at school then it is no wonder that I have not made many meaningful connections up to this point. I have made quite a few with professors in the program because they are getting to know me through my work ethic and through the papers I submit. I relate well with a few of them and feel that I have earned their respect which I am grateful for. I am three semesters in and now I am starting to make the connections I longed for with my fellow classmates. I am not looking for friends as much as just like minded people to share thoughts and ideas with. Ironically these connections are not forming because I have become more social and less professional minded but because of my professionalism. I am clearly not the only person in the program that approaches school this way and we who take the less social, more professional approach seem to be slowly gravitating towards each other. Regardless of why it is finally happening I am just glad it is. Technology Zombies Part Trois: This is not Communicating. As I mentioned in my last post, this semester comes with a multitude of projects. Many of which are to be done in groups. Group projects as a rule can be tricky but up to this point it has actually been pretty painless. I do have one small gripe however, it is less specific to the group project experience and more about phone etiquette and communication on a larger scale. When I was in high school cell phones were not the thing, it was all about the pager/beeper. I got my first cell phone as a graduation present after high school. I did not even start texting until my second cell phone a few years later. As I have mentioned in other posts I am not a big fan of texting. I prefer speaking by phone or in person than written communication, too much can be lost in translation not to mention it is time consuming, at least for me, I am not a fast texter. I could say what I need to say much faster than I could ever type it out on my phone’s keyboard. I do see the merit in a text if you just need a quick yes or no answer on something and you are unable for some reason to call, like you are in a meeting etc. With all of that said, I have noticed a trend that drives me a bit crazy. I know texting is popular, a lot of people seem to prefer it, that is fine. What I find annoying is when someone is texting me, not a quick “yes or no” type text, rather one that requires in depth explanation. With this I decide to call them, this requires a true conversation, and not only do they not answer but immediately after they text me again. My response is always call me when you are available to talk. They almost never do! 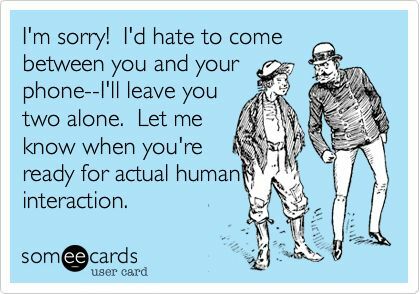 Almost inevitably I wind up getting another text a while later saying something like, “I am free now, whats up?” Um, No.. I said CALL. So I call again, they said they were free, and again no answer but another text right after I hang up. What is that?? 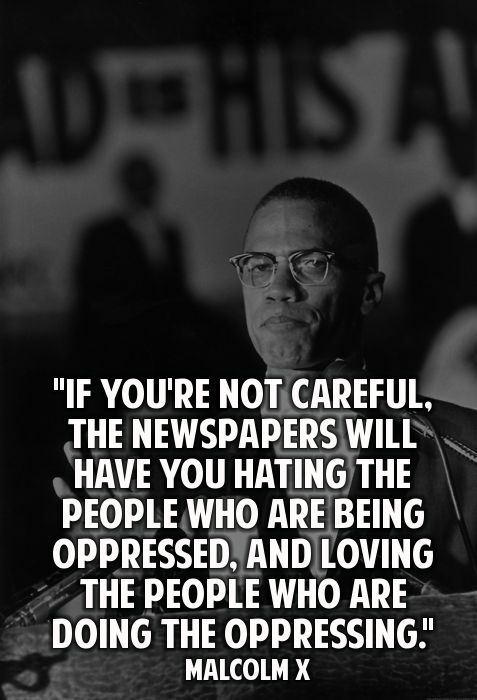 I bring this up because I have experienced this with more than 3 people now. One of which is an actual friend that I made a few years back at school. She is 10 years younger than me, as is everyone else that I seem to have this issue with. With her what I do now is if she wants to catch up with me via text I immediately make plans with her to meet face to face and catch up. I have known her for close to 3 years now and she has picked up the phone for me once in that time. If I didn’t like her so much this nonsense would be a deal breaker (as inflection is lost in text let me clarify, that last sentence was expressed with mild jest). My most recent experience was especially frustrating. I was assigned a partner for a short skit to be preformed in class about “appropriate self-disclosure with a client”. My classmate and I are to develop a 1-2 minute skit that is an example of this, easy enough. I had about three ideas before I even left class. To me this requires a five minute brainstorm by phone and we are ready. The classmate and I swap numbers and agree to contact each other over the weekend. She contacts me Friday and explains she would like to get together in person to discuss our skit. I agree to this and we start going over our schedules together, all via text. At one point the convo is getting pretty involved and I decide it would be easier to just hammer things out in a quick call. No answer, shocker. Then I do not hear from her for two days. I try to call again last yesterday, no answer. Also after sending a text I receive no response. I chalk it up to it being Super Bowl Sunday and decide to wait to hear from her. This morning I check in with her through two texts and she finally gets back to me saying she has sketchy cell service and does not always receive texts. All the more reason to speak by phone. She finally agreed to answer my call and it took 30 seconds to make a plan to meet. I mean really, what a waste of energy. I do not understand this way of communicating and find it truly lacking. Not to mention this nonsense does not fly in the “real” world. I did, on occasion, text with my executives when I worked at the hospital because they were often in meetings but you better believe that if a client or your boss calls you have to answer that phone. Ultimately I just feel like you lose so much of the connection when communicating like this. I will always prefer to discuss serious matters in person, everyday matters are fine by phone. Let me give an example of what I mean by losing the connection… One of my best girlfriends and I talk by phone about every other week. She has a child and a crazy schedule as do I with school and the things that keep me busy. We do not get to see each other as often as I would like but these calls we have tide me over until I can spend time with her in person. I have never felt as good from a text message as I do after getting to hear her voice on a half hour phone call. We talk, we laugh and I feel like she is in the room with me. Not to mention it meas something to me that she devoted a whole half hour of her busy day just to speak with me. That is the connection. A text can never replace her laugh, it will never feel as good as hearing her voice. That is what is lost.